Eric Gavin’s 162-reg Mercedes-Benz Arocs rear-steer Tridem truly is one of a kind. Supplying the best-quality materials to the construction trade in the greater Dublin / Kildare region for over half a century, PJ Gavin Sand & Gravel underlined its commitment to customer service by investing in the spectacular new tipper truck last year. In so doing, the County Kildare operator became the first company in Ireland to take possession of the new Mercedes-Benz Arocs Tridem - a heavy-duty construction vehicle that delivers power, robustness and efficiency in equal measure and is totally at home both on the road and on-site. The new Arocs, looks fantastic in the company’s striking green, red and yellow livery and performs tremendously in the most demanding of conditions. 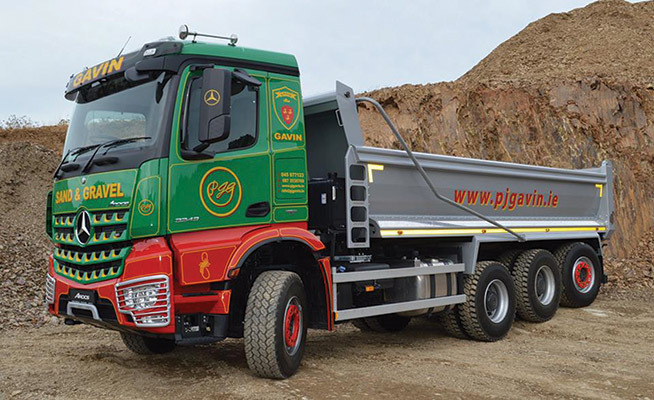 The truck epitomises PJ Gavin Sand & Gravel’s commitment to providing customers with the best possible service. The Gavin family is synonymous with the sand and gravel business in the greater Dublin area. Since the 1950s, they have grown into one of the premier suppliers of sand, pebbles, all grades of crushed stone, Clause 804, Clause 808 and SR21 Annex E to developers, utility companies and road contractors etc. 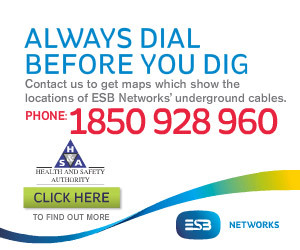 in the Kildare / Dublin / Wicklow region, offering a personal touch and competitive prices. Eric is looking forward to Full of the Pipe: “I’ll definitely be heading over to it. It’s beside me here now in Punchestown as I’m based in Kill. It’s only down the road. The show got so big that it had to be moved to a new venue and Punchestown is a great location. Regarding his superb tipper, Eric adds: “It’s relatively new. I only picked it up in September. It’s a Mercedes Arocs Tridem rear-steer truck, with one axle on the front and one on the back to steer it. I felt it was time to move with the times and try it out and it has proven to be a real success. It’s the only one of its kind in the country so far and it’s got 30,000km on it. “It has proven to be easier on fuel because the rear axle lifts off the road when it’s empty. And wear and tear is less too, with the rear axle up in the air. But when you are carrying a full load that axle drops and you could get the truck literally into anywhere. The truck is also a real head turner. “I’ve had people following me into building sites and petrol stations to ask me about it because they have seen its ability and it is really impressive,” Eric notes. The Kildare man currently operates a fleet of seven. “We have a grab truck now and one for tar with chutes on it. We now have something to handle everything for construction sites – stone, muck, sand, gravel, tar, etc. We cover all of Leinster but most of our work is in Dublin and I’ve noticed a real surge in activity in the city centre. “There’s a phenomenal amount of work in and around the docks and that’s why I’ve bought the Tridem, because it is so different and so much more flexible than your conventional eight-wheeler. It’s a very specific order here in Ireland but these are all you see in Scandinavia I figured that if the Scandinavians were using them, then they were probably the way to go.